The 2019 Solidarity Forever Labor History Calendar celebrates the legacy of great strikes, from the Seattle and Winnipeg general strikes of 100 years ago to the wave of teachers� strikes last year that gave renewed hope to a U.S. labor movement that has suffered decades of defeats and retrenchment, and to millions of workers struggling to survive. The calendar features photos from strikes in Argentina, Canada, Iceland, India, the Philippines, Poland, South Africa, and the United States. These strikes toppled authoritarian regimes, forced an end to boss wars, supported workers fighting against exploitation, and demanded gender and racial equality. They were concrete manifestations of workers' power, and of the possibilities of building a new world based on solidarity. We invite you to remember these struggles and to reflect on the possibilities for reviving a labor movement committed to solidarity, and to a vision of justice and workplace democracy. 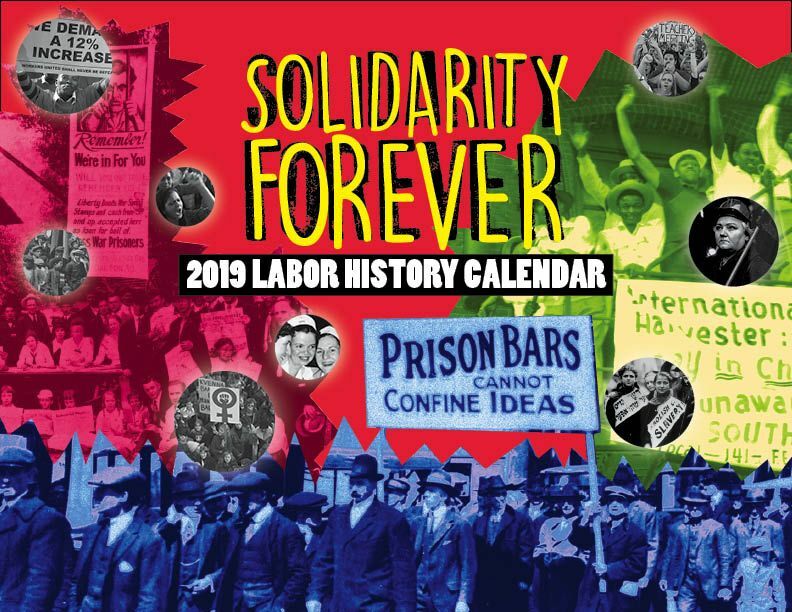 The Solidarity Forever Labor History Calendar has been published by the Hungarian Literature Fund since 1985 to inspire greater labor solidarity and preserve the memory of workers� struggles around the world.